myODU also allows you to customize your own myODU page. You can choose from various color themes and content feeds to create your own personal ODU web experience. The following instructions will inform you how to login and customize your settings. Internet Explorer 5.0 or better must be installed on your computer. Cookies must be enabled. For information about cookies, please refer to our Enabling Cookies help document. Click on the Login button . At this point, you will need to enter your ODU network username and password. You will find the Main Menu on the left side of the screen. 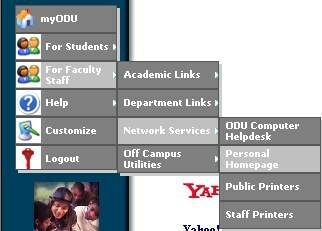 Here, you can choose from ODU online services and web pages, as well as customize your myODU page. Available menu selections will be based on your status: student or faculty/staff. 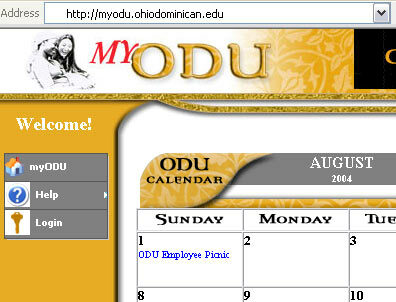 The first time you login to myODU, you will see the gold color theme and the ODU event calendar. You can customize your page to use a different color theme, and/or add content feeds (e.g., news, sports, entertainment) and weather information. In addition, you can set the page to Auto-Login on the computer you are using. Click on the Customize button , which you will see only after you have logged in. If you'd like to change Color Themes, click on the button next to the color you want to use. For the Content Feeds, you are able to choose up to three feeds to include on your myODU start page. Scroll through the available choices, and click on the check box beside the option you want to use. You will need to go back through the list of content feeds and deselect items until you have only three selected. 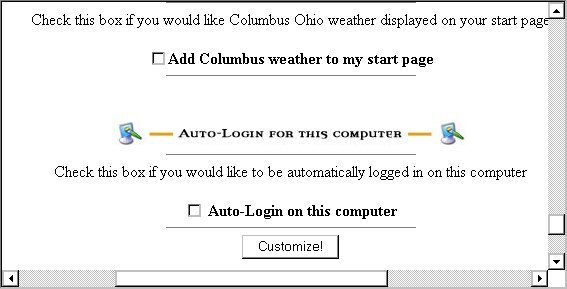 You can also select to add Columbus weather to the start page. By checking the Auto-Login option, you will be automatically prompted to login when accessing myODU. This feature will be available on the computer you are currently using. When you are finished making your customization choices, click on the Customize! button . You will see that the changes you have made are reflected in your personalized myODU start page. If you added content feeds, the ODU events calendar will now be minimized to the calendar link-bar menu. Click the category you would like to view or click "All Events" to view entire month's events, or click on individual links for the current day's events above the calendar link-bar menu. Several online services are available to students and faculty/staff through myODU. Click on the appropriate Main Menu option for you (i.e., For Students or For Faculty/Staff), and you will see a variety of online services and web pages from which to choose. Click on the selection that you want to use. Another window will open for the option that you selected. Note: myODU determines if you are a student or faculty/staff based on your login, so you will see all of the available choices for your status. You can either close the window, or click on the Return to myODU link.